- AES - Advanced Encryption Standard increases performance on encryption apps like TrueCrypt and PCMark. 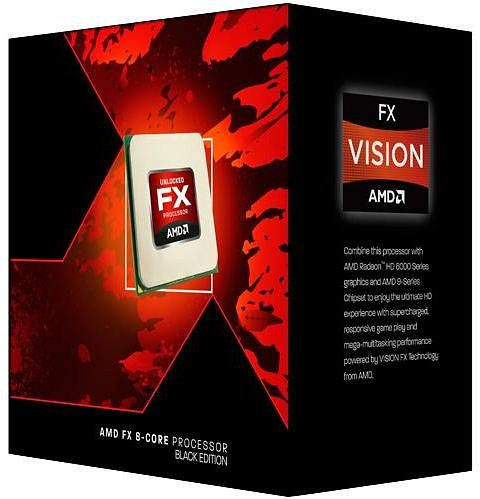 We call it the new AMD FX 8-Core Processor Black Edition and it's unlocked for your overclocking pleasure. Experience unmatched multitasking and pure core performance with the industry's first 32nm 8-core desktop processor. Get the speed you crave with AMD Turbo CORE Technology to push your core frequencies to the limit when you need it most. Go beyond the limits of maximum speed with easy-to-use AMD OverDrive technology and AMD Catalyst Control Center software suites. But the best part of all? You'll get all this impressive performance at an unbelievable price. You'll be asking yourself "what competition?" in no time. - The industry's first and only native 8-core desktop processor for unmatched multitasking and pure core performance with "Bulldozer" architecture. - Up to 37GB/s total delivered processor-to-system bandwidth. - Direct communications to each core in Dual-Core module. - Silicon feature-set enhancements designed to improve the performance, reliability and security of existing and future virtualization environments by allowing virtualized applications with direct and rapid access to their allocated memory. - Power can be switched on or off within a single clock cycle, saving energy with minimal impact to performance.